Posts tagged " public procurement "
In the UK where ‘First-Past-the-Post’ electoral rules are the norm in local elections, with the exception of Scotland and Northern Ireland, lack of local electoral accountability poses a high risk to government integrity as voters may not be able to elect an alternative to the cor­rupt incumbent. The persistence of uncontested seats and one-party dominated councils at the local level is a cause for concern across England in terms of quality of public services, value for money, and government responsiveness to citizen needs. DIGIWHIST project coordinator Mihály Fazekas published last week a report based on big data titled ‘The Cost of One-Party Councils: Lack of Electoral Accountability and Public Procurement Corruption’ for the UK based Electoral Reform Society. Mihály Fazekas investigates the impact of weak electoral accountability on corruption in public pro­curement, explored at the local level in England (excluding London). In this context, weak electoral accountability at local elections is understood 1) if a borough is hav­ing a large share of uncontested seats (i.e. at least 10% of seats) or 2) if a council is being over­whelmingly controlled by the same party for 10 years or more (i.e. same party controlling more than 2/3 of seats without interruption). Fazekas uses administrative data on electoral outcomes as well as on public procurement tendering procedures from 2009-2013 for 132,000 public procurement contracts. It employs an innovative measure of corruption risks in public procurement capturing a set of ‘red flags’ such as single bid submissions or shortened lengths of time between advertisement and submission deadline, signaling the likely steering of government contracts to a favoured bidder. 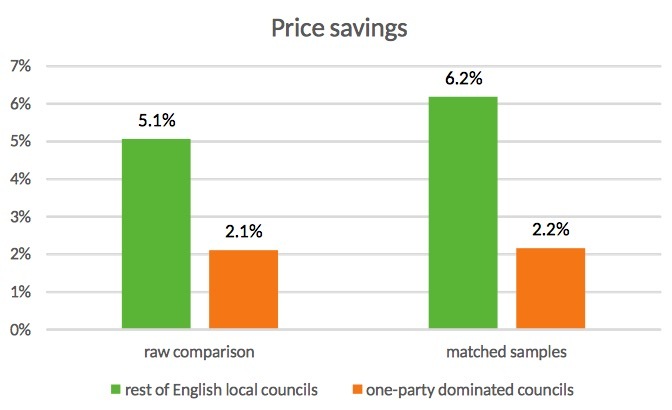 Based on the comparison of matching contracts, the findings suggest that weak elector­al accountability may lead to substantially higher corruption risks and lower price savings in English local councils. Councils of weak electoral accountability are roughly 50% higher corruption risk than their competitive counterparts which also coincides with foregone savings of 1-4% of contract value. The foregone savings by councils with weak electoral accountability roughly amount to £2.6bn annually. This is substan­tial given the total £45bn annual spending estimate. The figure above shows that median differences between matched contracts (matching serves to correct the varying spending composition among different locality types e.g. contract value or main product group of purchase) of different council types in terms of cost savings achieved in procurement tenders are substantial: 6.2% versus only 2.2%. The results on the local level are very diverse though as not in every locality there is such a negative effect. Based on these findings, it is very commendable that European Commission decided that indicators such as single bidding and lack of publishing the call for tenders constitute key aspects of public procurement performance and have included them into its procurement scorecard.